The top level of the Dewey Decimal Classification (DDC) system is an example of how chunking information along a single dimension can be an effective way to communicate a coherent narrative about data. In the graph, I've laid out the DDC along the "Foof factor" dimension where Foof is a cross between Froofy and Poofy. The distribution of topic areas tells us the following story about the contents of Libraries: The bulk of writing lies in the middle of the curve in the soft sciences and humanities. 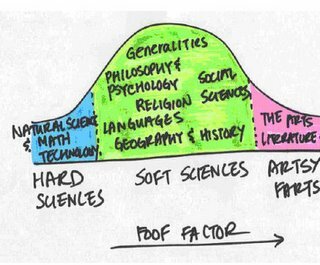 There is considerably less writing at the ends of the spectrum: hard sciences and the arts. This makes sense since you could say that the primary by-product of the soft sciences and the humanities is expository (explanatory) writing whereas the hard sciences and the arts are more concerned with creating "things" as opposed to writing about things: ie. theorems, technologies or works of art.